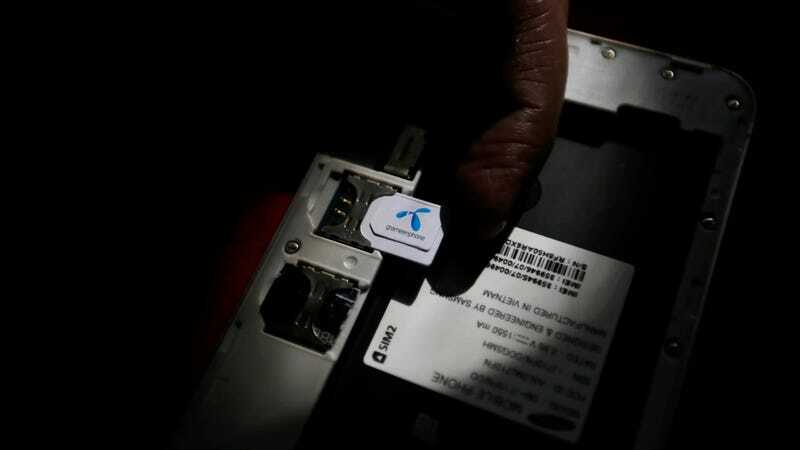 A file photo of a SIM card in Bangladesh. Florida police made an arrest last month in an alleged “SIM-jacking” ring, with court documents claiming the scammers involved stole SIM cards belonging to other individuals and used them to amass a small fortune. Fraudulently obtaining a victim-specific SIM card, a small smart card that associates a mobile device with a specific subscriber’s account, allows an attacker to remotely seize control of the victim’s phone number. That’s a big problem, seeing as many major services from cryptocurrency exchanges to Amazon allow users to recover or change account credentials by using an associated number. Per the Verge, court records first dug up by security researcher Brian Krebs show that investigators in Canton, Michigan first learned of the alleged scheme when a mother overheard her son pretending to be an AT&T employee on the phone. Searches of his computer revealed databases of names and phone numbers from both AT&T and T-Mobile customers, eventually discovering he had a obtained large number of SIM cards tied to victims in at least seven states, some of whom said that they had been pilfered of tens of thousands or even hundreds of thousands in cryptocurrency. That suspect, referred to as CS1 in court documents, eventually led investigators to an alleged SIM-jacking ring based on chat services Discord and Telegram. According to the court documents, the group operated by obtaining personal information on victims and then either bribing or impersonating cellular service company employees to obtain a “new SIM card activated with the victim’s information.” From there, it was simple to compromise the victim’s e-mail accounts and cryptocurrency wallets. The scammers would then allegedly transfer the cryptocurrency into another wallet before re-laundering it into another cryptocurrency and sending it to a clean wallet that appeared legitimate. According to the court documents, investigators with the Pasco Sheriff’s Office in Florida arrested a man named Ricky Handschumacher, who they said bragged about using proceeds from the scam to purchase vehicles in the Discord server and whose identity was confirmed from Coinbase records. “Handschumacher confessed to his involvement in the crime post Miranda and admitted to using his cell phone to launder cryptocurrency in amounts greater than $100,000,” the complain concludes. The Pasco County Sheriff’s office says their surveillance of the Discord server revealed that the group routinely paid employees at cellular phone companies to assist in their attacks, and that they even discussed a plan to hack accounts belonging to the CEO of cryptocurrency exchange Gemini Trust Company. The complaint doesn’t mention the CEO by name, but the current CEO is bitcoin billionaire Tyler Winklevoss, who co-founded the exchange along with his twin brother Cameron. In the buzzing underground market for stolen social media and gaming handles, a short, unique username can go for between $500 and $5,000, according to people involved in the trade and a review of listings on a popular marketplace. Several hackers involved in the market claimed that the Instagram account @t, for example, recently sold for around $40,000 worth of Bitcoin. Controlling a phone number allows for an attacker to bypass most forms of security, including two-factor authentication. When Did Ajit Pai Know?